Hey friends! I'm sharing some recent hair favs from L'ange with y'all today because I want to share products that I use and love with you guys! One of my top questions is what do I use to style my hair and I'm excited to share my latest obsession. 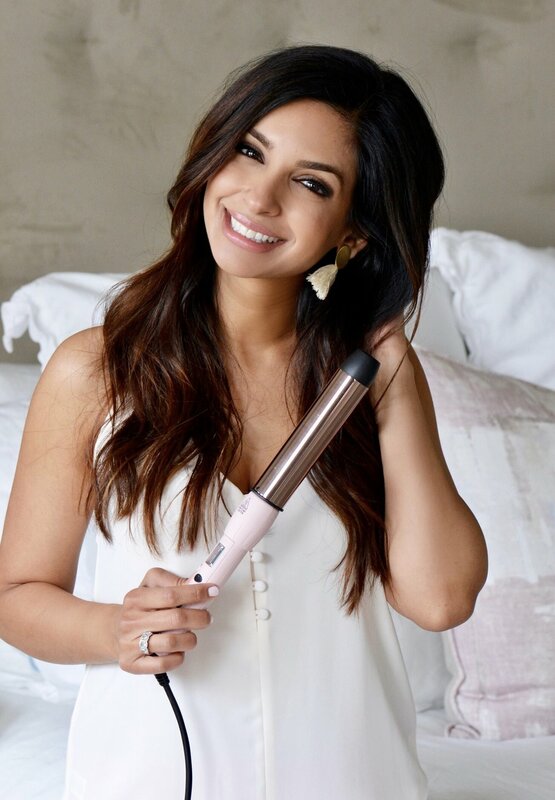 I was so excited when L'ange contacted me and offered to send me one of their curling wands and a few of their products to try out. After reading about the different tools, I chose the Lustre 32MM Titanium wand in blush which has a 1.25" barrel. Since I have long hair, I have always loved a larger barrel for a looser wave, but they do have 1" barrels as well. I chose this one because it's been known to work well for thicker hair, and I also love that it has a temperature control and automatic shut off (I can't tell you how many times I've accidentally left my other hair tools on for hours on end and thank goodness it's been ok up to this point, but I feel all of them should have this feature!!). I've been super impressed with how well my curl stays after using this wand, and I have tried several others in all different price ranges. Some of the products I've been using are the Heat Shield which I highly recommend prior to styling to protect from heat damage, the Whip Volumizing Mousse, and the Silk Venom Hair Masque. The mousse gives me my hair so much volume without feeling sticky and I really love it! I've used the masque twice now and my hair feels sooo silky afterwards. I have to mention how amazing all of these products smell, even my husband has noticed ;) I've really been loving the way my hair looks and feels! My friends at L'ange were SO sweet to give my followers an amazing 50% discount off of your purchase using the code NASREEN. You definitely don't want to miss out on that deal! Happy shopping, friends! Oh, and I promise an updated hair tutorial is coming very very soon!